The Commandant is nominated by the President for a four-year term of office and must be confirmed by the Senate. By statute, the Commandant is appointed as a four-star general while serving in office. "The Commandant is directly responsible to the Secretary of the Navy for the total performance of the Marine Corps. This includes the administration, discipline, internal organization, training, requirements, efficiency, and readiness of the service. The Commandant is also responsible for the operation of the Marine Corps material support system." Since 1801, the official residence of the Commandant has been located in the Marine Barracks in Washington, D.C. and his main offices are in Arlington County, Virginia. The responsibilities of the Commandant are outlined in Title 10, Section 5043, the United States Code and the position is "subject to the authority, direction, and control of the Secretary of the Navy". As stated in the U.S. Code, the Commandant "shall preside over the Headquarters, Marine Corps, transmit the plans and recommendations of the Headquarters, Marine Corps, to the Secretary and advise the Secretary with regard to such plans and recommendations, after approval of the plans or recommendations of the Headquarters, Marine Corps, by the Secretary, act as the agent of the Secretary in carrying them into effect, exercise supervision, consistent with the authority assigned to commanders of unified or specified combatant commands under chapter 6 of this title, over such of the members and organizations of the Marine Corps and the Navy as the Secretary determines, perform the duties prescribed for him by section 171 of this title and other provisions of law and perform such other military duties, not otherwise assigned by law, as are assigned to him by the President, the Secretary of Defense, or the Secretary of the Navy". Thirty-seven men have served as the Commandant of the Marine Corps. The first Commandant was Samuel Nicholas, who took office as a captain, though there was no office titled "Commandant" at the time, and the Second Continental Congress had authorized that the senior-most Marine could take a rank up to Colonel. The longest-serving was Archibald Henderson, sometimes referred to as the "Grand old man of the Marine Corps" due to his thirty-nine-year tenure. In the history of the United States Marine Corps, only one Commandant has ever been fired from the job: Anthony Gale, as a result of a court-martial in 1820. 1 NicholasSamuel Nicholas O-04 Major 28 November 1775 27 August 1783 7003282900000000000♠7 years, 272 days The first de facto Commandant for his role as the senior-most officer of the Continental Marines. 3.03 WhartonFranklin Wharton O-05 Lieutenant colonel 7 March 1804 1 September 1818 7003529100000000000♠14 years, 178 days The first Commandant to be court-martialed (acquitted) and the first to occupy the Commandant's House at the Marine Barracks, Washington, D.C.
GaleAnthony Gale O-05 Lieutenant Colonel 3 March 1819 8 October 1820 7002585000000000000♠1 year, 219 days The second Commandant to be court-martialed and the only Commandant to be fired. Burial location is unknown and no photos have ever been located. 13 LejeuneJohn A. Lejeune O-08 Major General 1 July 1920 4 March 1929 7003316800000000000♠8 years, 246 days Started the tradition of the birthday ball with Marine Corps Order 47, still read annually. Commanded a US Army division (the 2nd Infantry Division) in combat during World War I. 16 RussellJohn H. Russell Jr. O-08 Major General 1 March 1934 30 November 1936 7003100500000000000♠2 years, 274 days The system of seniority promotions of officers was changed to advancement by selection, the 1st Marine Brigade was withdrawn from Haiti, and the number of ships carrying Marine detachments continued to increase. 19 CatesClifton B. Cates O-10General 1 January 1948 31 December 1951 7003146000000000000♠3 years, 364 days Recipient of the Navy Cross. Commandant during early stage of the Korean War. 20 ShepherdLemuel C. Shepherd Jr. O-10General 1 January 1952 31 December 1955 7003146000000000000♠3 years, 364 days Recipient of the Navy Cross and last World War I veteran to be Commandant. First Commandant to serve on the Joint Chiefs of Staff. Commandant during the Korean War. 21 PateRandolph M. Pate O-10General 1 January 1956 31 December 1959 7003146000000000000♠3 years, 364 days Commandant between U.S. involvement in the Korean War and Vietnam War. 22 ShoupDavid M. Shoup O-10General 1 January 1960 31 December 1963 7003146000000000000♠3 years, 364 days Recipient of the Medal of Honor. Opposed U.S. involvement in South Vietnam based on strategy and undue influence of corporations and military officials in foreign policy. Historians consider Shoup's criticisms to be among the most pointed and high-profile leveled by a veteran against the Vietnam War. 24 ChapmanLeonard F. Chapman Jr. O-10General 1 January 1968 31 December 1971 7003146000000000000♠3 years, 364 days Was the Commandant during the final years of U.S. involvement in the Vietnam War. During his period in command, the III Marine Amphibious Force withdrew from Vietnam and the strength of the Corps dropped from a peak of 289,000 to 198,000. 29 GrayAlfred M. Gray Jr. O-10General 1 July 1987 30 June 1991 7003146000000000000♠3 years, 364 days The Alfred M. Gray Research Center at Marine Corps Base Quantico houses the Marine Corps Archives and Special Collections, the Quantico Base Library, and the research library for the Marine Corps University. As a reminder that the primary role of every Marine is a rifleman, he had his official photograph taken in the Camouflage Utility Uniform, the only Commandant to have done so. 30 MundyCarl E. Mundy Jr. O-10General 1 July 1991 30 June 1995 7003146000000000000♠3 years, 364 days After retirement, he served as president and CEO of the United Service Organizations (USO), and was the chairman of the Marine Corps University Foundation. 31 KrulakCharles C. Krulak O-10General 1 July 1995 30 June 1999 7003146000000000000♠3 years, 364 days Was the son of Marine Corps Lieutenant General Victor H. Krulak. Came up with the concept of the 'Strategic Corporal' and the 'Three Block War'. Introduced The Crucible, a final test of Marine recruits. 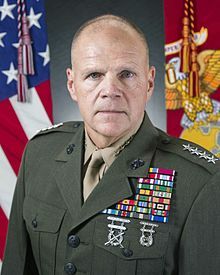 32 JonesJames L. Jones O-10General 1 July 1999 12 January 2003 7003129100000000000♠3 years, 195 days Oversaw the Marine Corps' development of MARPAT camouflage uniforms and the adoption of the Marine Corps Martial Arts Program; later became the first Marine officer to serve as Commander, U.S. European Command (USEUCOM) and NATO's Supreme Allied Commander Europe (SACEUR), then as National Security Advisor for the Obama Administration. 34 ConwayJames T. Conway O-10General 13 November 2006 22 October 2010 7003143900000000000♠3 years, 343 days Commanded Marines forces in the Iraq War and oversaw expansion of the Corps to 202,000 personnel. First Commandant in nearly 40 years to have not served in the Vietnam War. 35 AmosJames F. Amos O-10General 22 October 2010 17 October 2014 7003145600000000000♠3 years, 360 days First naval aviator to serve as Commandant. 36 DunfordJoseph Dunford O-10General 17 October 2014 24 September 2015 7002342000000000000♠342 days First Commandant and second Marine to be promoted to Chairman of the Joint Chiefs of Staff. ^ a b c 10 U.S.C. § 151 Joint Chiefs of Staff: composition; functions. ^ "Appendix A: How the Marines Are Organized". Marine Corps Concepts and Programs 2006 (PDF). United States Marine Corps. p. 252. Retrieved 6 May 2007. ^ a b c d "Commandants of the U.S. Marine Corps". Historical Topics: Frequently Requested. Reference Branch, History Division, United States Marine Corps. Archived from the original on 19 December 2011. Retrieved 21 October 2007. ^ Journal of the Continental Congress (10 November 1775). "Resolution Establishing the Continental Marines". United States Marine Corps History Division. Archived from the original on 7 October 2010. Retrieved 2 February 2010. ^ Hoffman, Col Jon T. (2002). Marine Corps Association (ed.). USMC: A Complete History. Beth L. Crumley (illustration editor), Charles J. Ziga (design), Col John Greenwood (editor), James O. Muschett (editor). Hugh Lauter Levin Associates. ISBN 0-88363-650-6. Archived from the original on 4 May 2009. ^ Krivdo, Michael E. (2009). "Harpers Ferry: Last Action of "Henderson Era"". Fortitudine. Quantico, VA: United States Marine Corps Historical Program. 34 (4): 7–11. ISBN 0-16-010404-1. Archived from the original on 27 May 2010. Retrieved 1 February 2010. ^ Shea, Sgt Jimmy D. (22 October 2010). "Taking the Reins: Marine Corps Welcomes New Commandant". Headquarters Marine Corps. United States Marine Corps. Archived from the original on 26 October 2010. Retrieved 22 October 2010. Wikimedia Commons has media related to Commandants of the United States Marine Corps.